On Monday night I attended the “The Oscars” for pastry, also known as The Top 10 Pastry Chef Awards presented by Dessert Professional Magazine. Ten of the best pastry chefs in the US all gathered in one place who, along with teams of 4-6 assistants, composed and plated over 300 fancy-pants desserts for attendees. There’s no judging or competition here, just lots of appreciation for the skills and careers of these accomplished chefs. Here’s a video of Pastry Chef and Owner Tariq Hanna from Sucre in New Orleans, discussing his “lipstick on a pig” plated dessert he prepared for the Top 10 Pastry Awards on Monday night. Tariq was a very popular figure at the pastry awards and his peanut butter-based dessert was a huge hit. Watch the video to learn more. 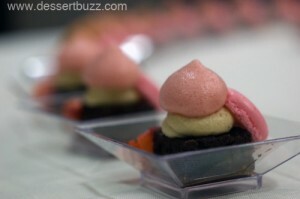 Follow DessertBuzz on Twitter for updates. Heather Carlucci-Rodriguez, Print Restaurant takes us through her chocolate bread dish. Ron Paprocki, Gordon Ramsay at The London talks about his Valrhona Chocolate Mousse. Francisco Migoya, Culinary Institute of America, talks about his Black Forest Pop. Antonio Bachour, Quattro, talks about his Vanilla bean Panna Cotta with apricot sorbet. Photos of all 10 plated desserts from the awards are here. For coverage from last year’s event go here. The CIA website is here. Dessert Professional’s web site is here.